Cryptocurrency- a word that has taken both the real and virtual world by storm in recent years and not always for the right reasons. But what exactly does it mean and why it is among the most hotly debated topics across the world today. Well, as amply evident from the word itself it’s got something to do with both cryptography and currency. When put together, it can be defined as an alternate form of digital currency used for payment which is much cheaper and cost effective too. It’s a kind of virtual money which does away with the need for cash, cheques or even a credit card to make a payment which can be made directly sans the need for an intermediary like a bank. It utilizes cryptography (the process of encrypting essential data and vice-versa) to verify and secure transactions and control the creation of new units of particular digital currencies. In simple terms, cryptocurrencies are akin to limited entries in a central database that cannot be tampered with or changed without triggering strict security protocols. Well to be perfectly honest, cryptocurrencies are not a new phenomenon. In fact, there were several attempts at creating a usable digital currency way back in the 90s during the tech boom. Some of the most notable examples that came to being were Digicash, Beenz and Flooz. But none of them survived for long – for a variety of reasons. Fraud, financial problems and internal issues among the companies that launched them were among the primary reasons for their abject failure. Interestingly all of them used a third-party facilitator to verify such transactions. With the collapse of such companies, it was thought to be the end of the road for virtual money as well. Until the introduction of Bitcoins in early 2009 – a new generation of digital currency – by a largely anonymous group of programmers under the alias of Satoshi Nakamoto. Described as a peer-to-peer electronic cash system, Bitcoins were totally decentralized – which meant there was no central authority or servers involved. This was also the most critical factor responsible for their survival and success. Courtesy its decentralised networks, every participant involved in a Bitcoin transaction plays a significant role. The technology used to facilitate this process is known as Blockchain. Loosely put, it’s a public ledger that keeps a detailed and secure record of all the transactions that happen in the network. It’s also available to everyone which means that everyone (in the network) can check the balance in every account. Every completed transaction is recorded in a file format which includes the wallet addresses of both the sender and receiver and the exact number of coins transacted. As an added safety measure, every transaction is required to be signed off by the sender using their private key. Miners are by far the most crucial part of any crypto network and mining, akin to making an investment. Miners provide what can be termed as a – bookkeeping service – to their network. They solve complicated cryptographic puzzles necessary to earn a reward in Bitcoins (as a transaction fee) and to confirm a transaction and record it in the Blockchain. The difficulty levels of the puzzles keep increasing in direct proportion to the number of miners trying to solve it. Ergo the number of Bitcoins won by miners as their reward for solving a puzzle has reduced substantially – from 50 BTC at the onset to just about 12.5 presently – as per some estimates. Hence mining for Bitcoins is only profitable when the miner is ready to bear the enormous costs associated with buying and using industrial grade mining hardware, not to mention the monthly power bills that come with it. As per the present market scenario, Dogecoins, Feathercoins and Litecoins are among the most cost-effective virtual currency options for beginners. For example, a miner could stand to make approx. 50 cents to USD10 per day by opting for Litecoins and using only consumer-grade hardware. 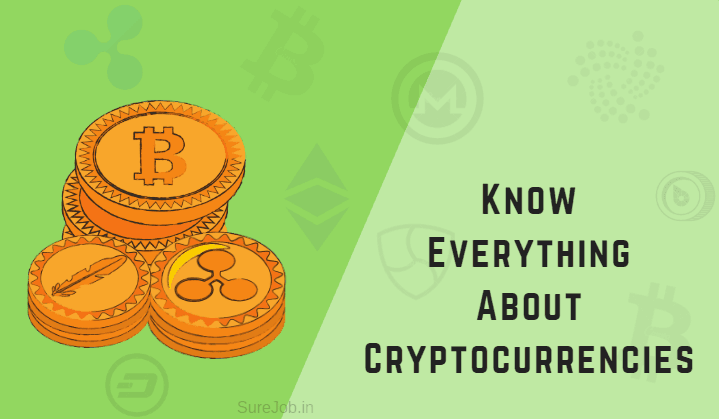 Those who follow the cryptocurrency market will be aware there are thousands of cryptocurrencies in existence today, with new ones being added regularly. According to industry data, the Top 10 popular cryptocurrencies today account for nearly 89 % of the total cryptocurrencies market, while the remaining 1,638 cryptocurrencies are cumulatively worth approx. USD39.6 bn. Bitcoin Cryptocurrency— the first viable digital currency ever. Ethereum — A programmable currency which enables developers to create different apps & technologies which are not compatible with Bitcoin. Ripple — It uses an iterative process (instead of Blockchain), to ensure a network-wide consensus for transactions, but is prone to hacking. Bitcoin Cash — A newly minted extension of Bitcoins, which is supported by the biggest Bitcoin mining company and the manufacturer of Bitcoin mining chips. NEM — Uses a Proof of Importance algorithm which requires users to possess a minimum number of coins prior to acquiring new ones. Litecoin — The ‘digital silver’ equivalent to Bitcoin’s ‘digital gold’. IOTA — Uses a new ledger technology called Tangle that removes dedicated miners from the process. NEO — Features many of the same goals as Ethereum. Developed in China and widely accepted by local businesses there. Dash — Employs a two-tiered network for miners and master-nodes which relay the transactions. Qtum — Formed by merging the tech used by Bitcoin and Ethereum. Targets business applications. What can I Buy With them? Until a few years ago, the answer to this question would have been an emphatic NOT MUCH. But not anymore. With time and the increasing popularity of cryptocurrencies like Bitcoins, the number of merchant establishments – both online and offline- which readily accept them as a form of payment has increased significantly. From select local shops, bars, restaurants to some big-ticket online retailers like Newegg, Overstock and Shopify, Bitcoins are now being widely used to buy gifts, jewellery, airline tickets and in some cases even college degrees. Gift Off, an online gift card seller accepts payments in about 20 different cryptocurrencies while renowned online retailers like OpenBazaar and Bitify only accept payments in virtual money. Presently there are a lot of different ways one can buy this virtual currency. For starters, there exist an estimated 1800 ATMs that dispense Bitcoins across 58 countries. Buyers also have the option of purchasing them using other available means like investment trusts, cryptocurrency exchanges, gift cards and even face-to-face trading. But do note that most of these options deal with only some of the more popular cryptocurrencies like Bitcoins, Ethereum, Ripple and Bitcoin Cash. Those looking for the not-so-popular currencies may find their opportunities very limited and not always accessible. Buying options solely depend on your choice of the digital currency, its availability, popularity and the buyer’s location. Unlike conventional currencies which can easily be saved in your wallet or bank locker, digital currencies employ an entirely different approach. Technically, a buyer doesn’t have any physical currency to store (its virtual currency, remember), what they get instead is a private key – which is used to sign for transactions in virtual currency – and which needs to be kept safe. One way of doing this is to use a cryptocurrency wallet – designed primarily to cater to digital currency storage needs. If privacy is a huge concern, buyers can also choose to opt for a hardware or paper wallet. Then there are cold or offline wallets that are stored online (in your online wallet or hard drive) and are linked to online exchanges or independent platforms. Well not quite everywhere just yet. When Bitcoins were first introduced, they created a significant furore in global markets. No one had ever seen a currency that didn’t have a physical form and wasn’t controlled by any single government authority. In fact, the debate is still on in many countries as to whether they should be accepted as legal tender and how best to fit them under the existing regulations and legal framework. A lot of concerns have since been raised about their inherently decentralized nature and ability to be used almost anonymously, making them an attractive proposition for people engaged in illegal activities. Authorities have also voiced their concern over their possible use in tax evasion and money laundering schemes. Consequently, a few countries like Bangladesh, Ecuador, Bolivia, Vietnam and Kyrgyzstan have already proceeded to ban them as of November last year. While others like China and Russia are close to following suit. Meanwhile in India, in the aftermath of the circular issued by the Reserve Bank of India (RBI) banning the use of cryptocurrencies earlier this year. The Law Commission of India has recently recommended to the Union Law Ministry to permit the use of Bitcoins (and other cryptocurrencies) for online transactions like settling gambling debts. This is being widely seen as the first essential step towards the eventual legalisation of cryptocurrencies in this country. Cryptocurrencies hold the key to the future and offer a new, user-friendly revenue stream in a rapidly digitised world. By virtue of not being tied down by any government regulations, agencies or interest rate fluctuations, they will only help in speeding up international transactions. Thereby, boosting global trade and economic growth. Regardless of the current climate of mistrust, the global market for cryptocurrencies is likely to grow on the back of several growth drivers which include their ease of transactions, productive security measures and push mechanism. Thus, this allows a currency holder to send the exact amount without sharing any further information. In a recent survey, over 70 % of mobile users globally have already expressed their preference for transacting over the phone. It’s only a matter of time before they opt for cryptocurrencies to cut short the transaction time. This could well trigger the most significant growth spiral for this nascent industry. Previous articleHow Much is the Cost of Education in India?